People deliver flowers, candles and cards to the home of former president Nelson Mandela in Johannesburg, South Africa, after his death Dec. 5. Maharishi University of Management’s executive vice president Craig Pearson was in the country at the time of Mandela’s death and witnessed how the public responded with kind gestures to the man they admired so much. Pearson was in South Africa on official business to give the commencement address at Maharishi Institute in Johannesburg. The institute is a sister organization of M.U.M. and the students who graduated from it received M.U.M. degrees. 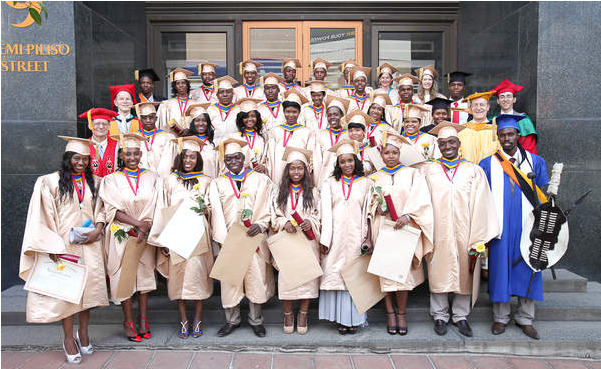 The students pictured are the first graduating class of Maharishi Institute in Johannesburg, South Africa. Maharishi University of Management’s executive vice president Craig Pearson, far right in second row, delivered the commencement address at the institute’s graduation ceremony in December. Maharishi University of Management’s executive vice president Craig Pearson received quite the honor in December when he was asked to give a college commencement address in South Africa. Pearson just so happened to be in Johannesburg when all eyes were on the country after the death of former president Nelson Mandela on Dec. 5. Pearson was able to witness first-hand the outpouring of support and admiration the locals had for the man who symbolized the nation’s struggle against racial separation. Upon his arrival in the country Dec. 2, the M.U.M. vice president learned he was staying a mere five blocks from Mandela’s home. Pearson planned to walk by the home to take photos, which would not be too difficult since it was normally a quiet street. Within a few days, the street outside Mandela’s home was packed full of people dropping off flowers and singing songs in honor of their fallen leader. On the morning of Mandela’s death, Pearson opened his laptop to check the news. He saw a headline that read, “The World Mourns,” and he knew right away what it was about. Pearson saw a “mountain range of flowers and hand-written notes” placed on the gate outside Mandela’s home. The Associated Press dubbed Mandela a “master of forgiveness” for his insistence on a peaceful cessation to the state-enforced racial separation known as “apartheid.” Mandela brought apartheid to an end after he became president of the country in 1994. Mandela became the country’s first black president after spending 27 years in prison for championing equality against the white-minority government. “The significance of what he accomplished goes far beyond the borders of the country,” Pearson said. 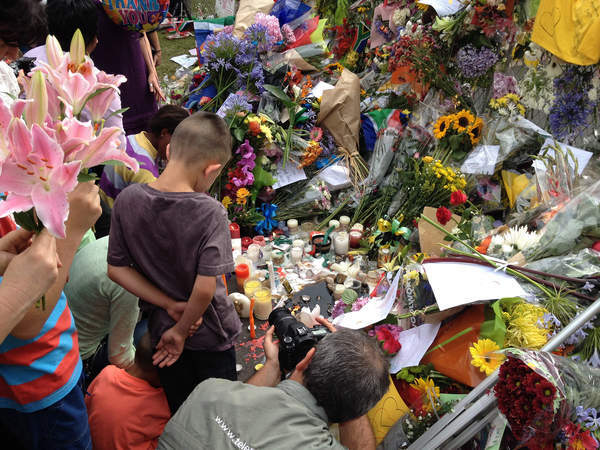 After the memorial service for Mandela at a large soccer stadium, South Africans approached Pearson to tell him they were touched by the words of President Barack Obama, who spoke during the service. 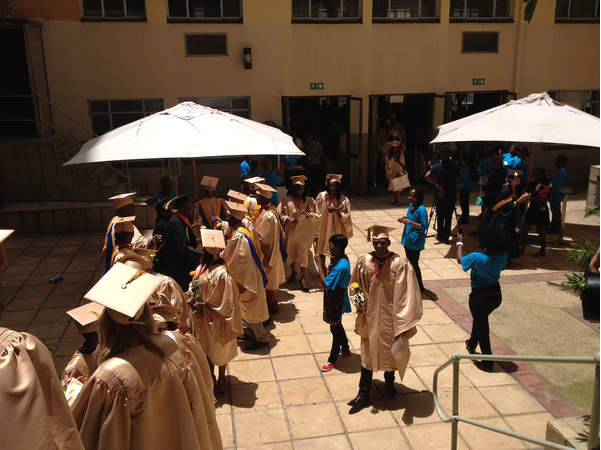 Maharishi Institute in Johannesburg held an assembly the day after Mandela died. Pearson was asked to speak at the assembly, and he said it was clear from the other speakers how much Mandela meant to everyone. Pearson said when he visited Mandela’s home he was only able to see the roof because the rest was obscured by a wall. He said that was not unusual and that nearly every house in the city has a wall around it topped with barbed wire. Pearson said Mandela lived in a well-off neighborhood but his house did not seem any more extravagant than his neighbors. Maharishi Institute, where Pearson gave his commencement address, began in 2006 and is affiliated with M.U.M. in Fairfield. In fact, the students at the institute are actually earning degrees from M.U.M.. In some cases their instruction is provided online and in other cases a professor from M.U.M. travels to South Africa to teach a class in person. The 27 students who received their diplomas in December are the first to graduate from the institute. Pearson said the institute hopes to expand in the near future by adding 1,000 students in February. Despite the end of state-sanctioned racial discrimination in 1994, blacks still lag far behind whites in educational attainment. Pearson said the institute was founded in Johannesburg to correct for the lack of higher education for blacks. Students at the institute receive 1.5 years of free education and then begin a work-study program. One form work-study takes is to work at a call center in the same building as the school. Students who don’t work in the call center work as janitors or some other occupation that maintains the school. Reprinted with permission from The Fairfield Ledger. The Monday Ledger ran this front page story five columns across with all three photos, two from South Africa, plus one of Craig Pearson. Dr. Pearson also spoke at the graduation of several managers at Neotel, one of the top communications companies in South Africa, who received MBA degrees from MUM. Also see MUM Executive Vice President Comments on Nelson Mandela and more photos at link.mum.edu/Mandela. This entry was posted on January 13, 2014 at 8:56 pm and is filed under Articles, Education, Maharishi University. You can follow any responses to this entry through the RSS 2.0 feed. You can leave a response, or trackback from your own site.